Languages spoken: Armenian, Bengali, Chinese, English, French, Haitian-Creole, Korean, Russian, Spanish and Tagalog. 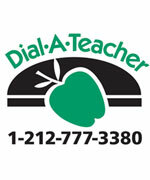 The Dial-A-Teacher program began in January of 1980. It was a pilot program in 17 schools in 8 districts. Five teachers were hired to field these questions with one teacher proficient in Spanish. Students throughout the city quickly began to use the program to get help with homework problems that stumped them. By 1986, the program expanded to include all elementary schools in the city through funding by the NYC City Council. The UFT provided a large space where the newly hired staff of 45 teachers could work. Hundreds of texts and reference materials were bought and Dial-A-Teacher was now a world-class source of help for all the elementary students in the city. The director of the Dial-A-Teacher program is Anthony Harmon. Sean Blanks is the coordinator who assists in the day-to-day administration of the program. The office telephone number is 212-598-9205. You can use this number to arrange for workshops, to order materials, to schedule classroom visits or to get general information about the program. If you need to speak to the director, call 212-510-6338.